BC : Northern Rockies Co.
July 05, 1989, L. G. Crabo. 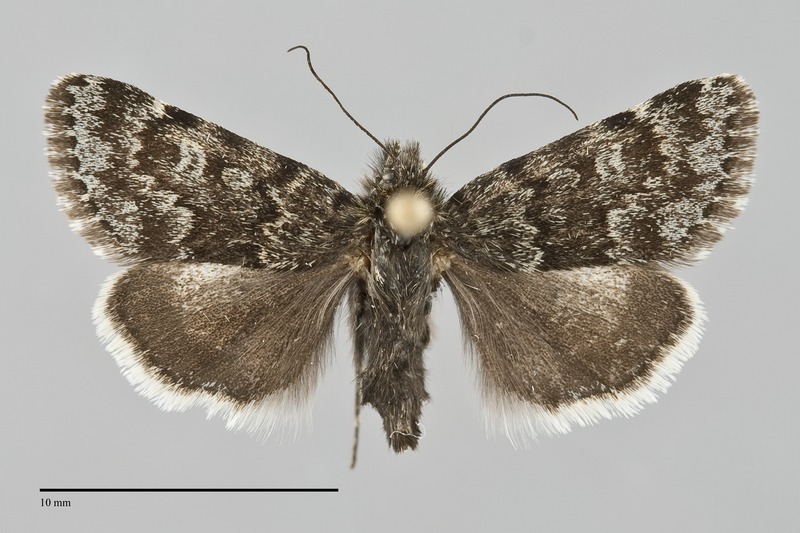 Sympistis zetterstedtii is a very small to small (FW length 10–12 mm) moth with glossy blackish gray forewings marked with light blue-gray lines and spots and a white hindwing with an even black marginal band that flies over rocky alpine tundra during the summer. The forewing is sprinkled with pale light blue-gray and or light yellow scales. The lightest areas are outside the median area, usually greatest in the terminal area, the medial subterminal area abutting the postmedial line, and on the entire wing base. The lines are dark gray with pale scales along the antemedial and postmedial line outside of the median area. The antemedial line is irregular, oriented straight across the wing. The median line is barely evident due to the dark ground color. The postmedial line is scalloped, bluntly excurved around the end of the cell and then curved to meet the trailing margin at a right angle. The subterminal line is pale, diffuse, and uneven, often toothed to the outer margin. The terminal line is thin. The fringe is dark gray, weakly moderately checkered. The spots are dark gray with pale peripheral and dark gray central filling. The orbicular spot is small, oval. The reniform spot is kidney-shaped. The claviform spot is absent. The ground color of the hindwing is pure white with extensive dark gray suffusion to the discal spot and along the inner margin. The veins and small, thin discal spot are gray. The blackish gray marginal band is sharply demarcated medially and even in width. The hindwing fringe is white with a gray base. The eyes are reduced in size. The head and thorax are dark black with yellow on the palpi and collar. Many of the scales are long and hair-like. The male antenna is filiform. This species is most likely to be confused with Sympistis heliophila, another small northerly species with white and black hindwings. Its forewing is crisply marked gray and white with white-filled spots. 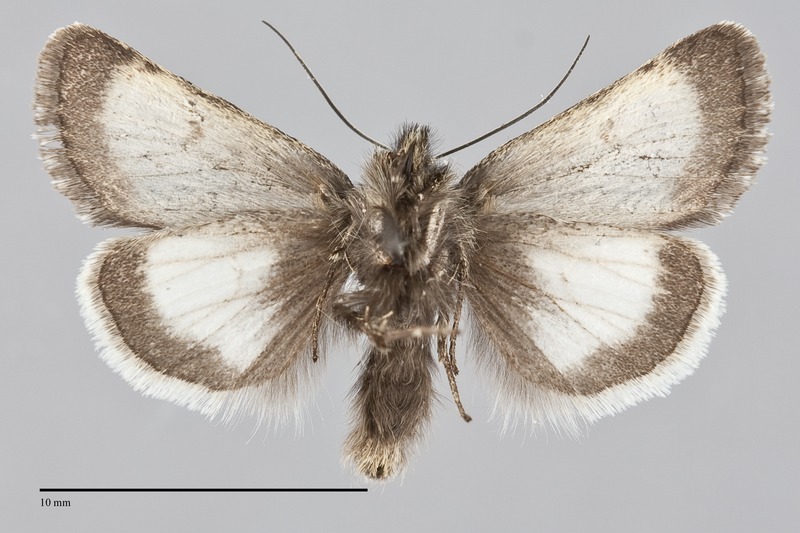 Its hindwing is whiter with reduced basal suffusion compared to that of S. zetterstedtii. Sympistis zetterstedtii could potentially be confused with Anarta nigrolunata, a species with which it flies in the mountains and far north. It differs from S. zetterstedtii in having hairy eyes and a large black discal spot on the hindwing. Xestia bryanti, a small day-flying moth from mountains of northern British Columbia, also resembles S. zetterstedtii but lacks the black marginal band on the dorsal hindwing. Populations of S. zetterstedtii are geographically variable. 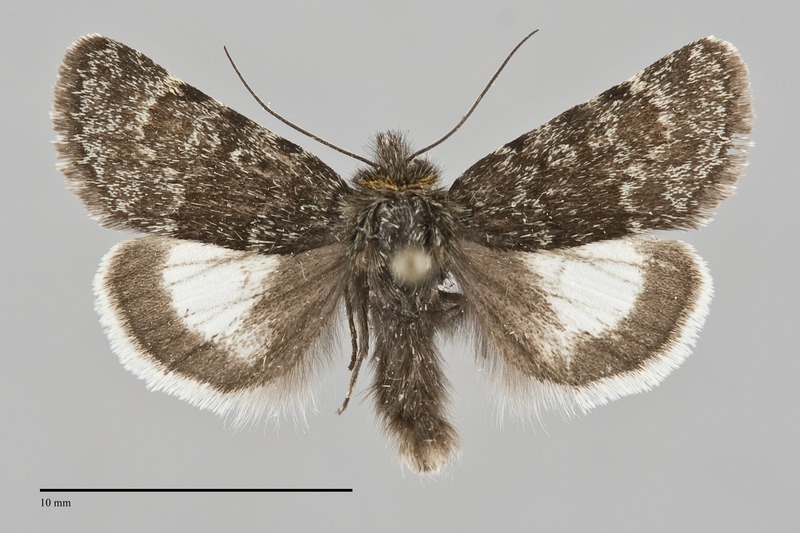 The subspecies S. z. kolthoffi (Staudinger) occurs in the Pacific Northwest. Its hindwing ground color white. In subspecies zetterstedti, found north of our area in Yukon Territory, the hindwing is black. The transition between these subspecies occurs just north of British Columbia. 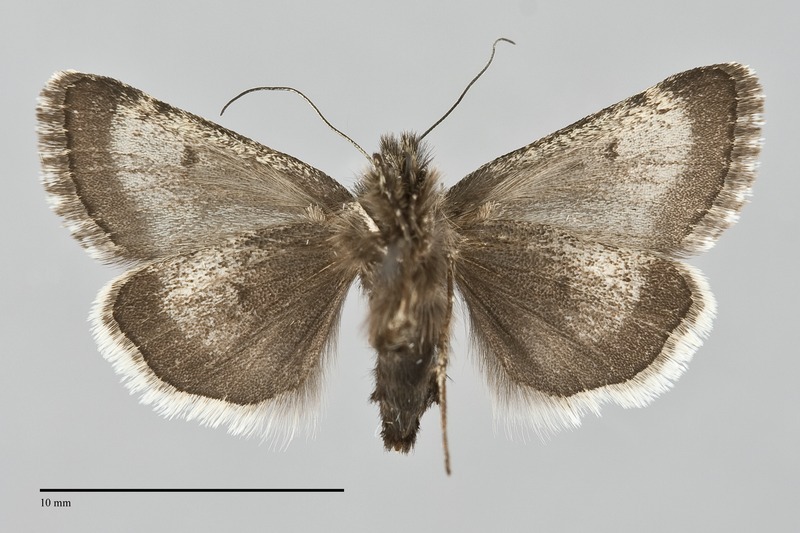 Specimens from the eastern North American arctic are more crisply marked on the forewing than those from the West. This species is endemic to alpine boulder fields and rock slides at high elevations above timberline. Sympistis zetterstedtii is widely distributed in the high mountains of British Columbia from the border with the continental United States to Yukon Territory. Its range is restricted to the Cascade Mountains near British Columbia in Washington. The species has a Holarctic distribution, occurring across Asia to Scandinavia in Eurasia. In North America it occurs in the High Arctic and Subarctic from Alaska to Hudson Bay, extending further east in the Canadian Arctic Archipelago. The range extends south to Alberta in the Rocky Mountains outside of the Pacific Northwest. This moth flies during the day. It frequently rests on the rocks. As an evasive maneuver this species will drop between the cracks in the rocks as often as it takes flight, frustrating those that try to catch it by slapping a net on top of the resting moth. It seeks nectar at the flowers of moss campion (Silene acaulis) and saxifrage (Saxifraga spp.). This species flies during the summer from June to August depending on location, elevation, and snowpack.